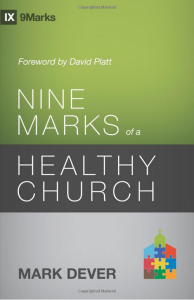 The “9 Marks” series by Mark Dever and his associates has been in print since 1997. This original book was reprinted in 2000 and again in 2004. I had not read Dever himself until now though I’ve read other 9-Marks books. Dever has become a prominent conservative evangelical, a well-known SBC pastor, and a Reformed Baptist writer. The book, therefore, is recommended by similar writers from Piper to MacArthur, from D.A. Carson to Albert Mohler, Jr. Setting up a number of “Marks” for a biblical church is not new. Dever lists about 40 other writers who have done the same thing in one form or another. I was pleasantly surprised how much I agreed with and enjoyed Dever’s own listing of 9 ingredients for a biblical church. I thought his chapter on the necessity for church membership was one of the best I’d ever read. His chapter on church discipline was also very good. Most of the “marks” on things like the need for good preaching, theology, discipleship, and evangelism almost go without speaking and are repeated by many good authors. I expected a Reformed Baptist like Dever to advocate a thoroughly Calvinistic definition of conversion and to advocate a plurality elder rule for leadership though I can’t be as enthusiastic with these.